I’m sorry I couldn’t post this yesterday as promised. There was a glitch in the system on the site I needed to post the entry. This chair used to be part of a dining set that we had when my boys were small. As you can see, the black paint is almost gone, and it’s in pretty bad shape. I started by sanding the chair with 120 -220 grit sandpaper. I used my Ryobi Mouse…love that little guy! It’s like the energizer bunny…just keeps going. I was able to sand down the small cracks, but the larger cracks were still there. I would have used wood filler, but I was worried the color wouldn’t be the same in those areas after I stained. Also the chair was made of different woods. (something I couldn’t tell when painted). At this point, I must say, I was a little discouraged. I started by using the Briarsmoke stain on it first..but I thought it was too dark for the look I was going for.I wanted some glam to it. I then went over it with the Bleached Blue stain. I liked how the brown stayed in the cracks of the chair, and the blue kind of highlighted them. I lightly sanded different areas to bring back some of the brown stain for the aged look. From there I used painters tape and plastic to cover the chair…all but the front bottom legs. 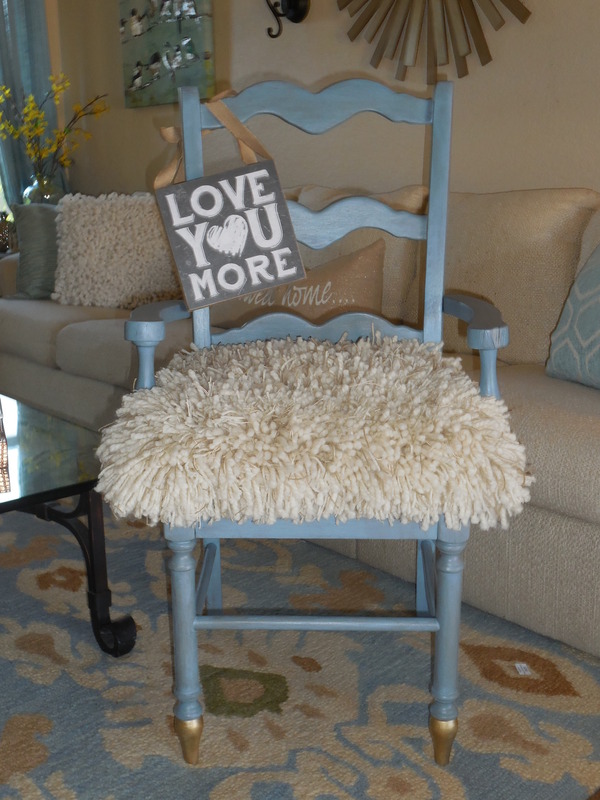 I sprayed them with the Gold Mirror Effect…I love this product and the look it added to the chair. I then applied a coat of Varathane Triple Thick Poly to the chair. I had never used this product before, and I love that I only needed to use one coat. The chair feels so soft and smooth. I had known exactly what I was going to do with the seat. I had recently made a rag rug that I was so happy with, you saw it here, I thought I would use a similar, but different, technique. I purchased 3 different types of yarn, in various thicknesses, hemp string, chair foam pad, and a non slip rug protector. For the next few days, I was watching movies and working on it. This is what I purchased….this pic also shows what the back looks like when done…What I did was find a small book 6″ wide. You could also use a piece of cardboard cut 6″. I wrapped, and wrapped, and wrapped one of the yarns around it. ‘like your making a pom pom’ then cut at the top, then bottom…there you go…lots of pieces at once. Do this with all the yarns. I started by cutting the yarns in 6″ lengths.You slip a crochet hook in one little square with a strand attached and come up on the one next to it.then tie a knot. Keep going..using a random pattern. I had purchased a foam pad from the store and cut to fit the seat of the chair. This is the back when done! I then purchased a canvas, and spray painted the sides with the Aged Gray Chalked spray paint. I then taped the sides and sprayed the front of the canvas with Rusto oleum Chalk Board spray paint. I used white paint for the lettering. I then took burlap ribbon and went around the sides and attached thumbtacks to hold it down, and tied a bow at the top. I then purchased a canvas, and spray painted the sides with the Aged Gray Chalked spray paint. I then taped the sides and sprayed the front of the canvas with Rusto oleum Chalk Board spray paint. I used white paint for the lettering. I then took burlap ribbon and went around the sides and attached thumbtacks to hold it down, and tied a bow at the top. And here it is….finished….Please let me know what you think. I think I am really liking the ‘shag’ rug look on chairs and stools. I would probably use a premade one. Get one at the dollar store or thrift store? I’m definitely keeping my eyes open! This is sooo cute! Then you KNOW why I answered like that Kim! Shame on you comparing this with a dollar store rug! Unless you took 5 of those rugs, and sewn them together to form a pouf, and stick peanuts or tons of those tiny foam balls inside. Thank you, lots of time listening to music and watching movies while creating the seat cover! I found that old chair on a curb. Free…love free! Wow what a fabulous come back for that chair! Thanks so ! I thought so too! Isn’t it amazing what a crusty broken down chair can become with a little elbow grease and some paint? Congrats on your move honey! Your going to love Colorado. Thank you so very much Dandelion! I love that chair and visit it at my friends house. She nabbed it from me, but I kept the shaggy seat! I think you’re a magician!